Fertilizer is important for most plants. It replenishes or adds nutrients and minerals to the soil and encourages vegetative growth or increased blooming and fruiting. Sometimes, however, knowing just how much fertilizer to give plants -- and when to fertilize them -- can be tricky. 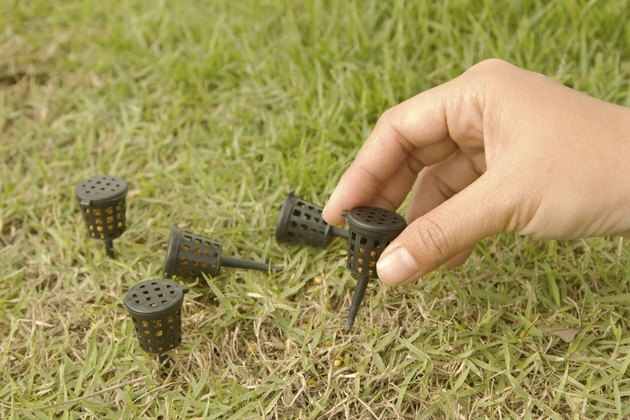 Fertilizer spikes are one option that may make feeding your plants easier, but they work only when used properly. Close-up of woman installing fertilizer spikes. Fertilizer spikes are hard, compressed spikes made of plant food and other ingredients. Many contain formaldehyde, but others are completely organic. They are actually designed to be hammered into the ground. Although fertilizer spike manufacturers may claim that the spikes take the guesswork out of fertilizing, that claim is true only up to a point. The spikes work, but you still have to calculate how much fertilizer to use for your specific plants. If you don't calculate correctly and end up using too few or too many spikes, then your plants will suffer. Fertilizer spikes are designed to release nutrients slowly into soil -- and they do, but sometimes not very effectively. Bacterial and fungal activity, not water, triggers most of the nutrients' release. Although fertilizer spikes are convenient, they are not as cost-effective as liquid or granulated fertilizers, and sometimes it is difficult to get the dosages exactly right because each spike contains a predetermined amount of nutrients. Because of the spikes' design, they release nutrients laterally, which means the nutrients may not reach deep roots. In addition, the nutrients usually don't distribute evenly over soil, unlike liquid or granulated fertilizers when they are applied properly. For those last two reasons, the use of fertilizer spikes is not usually recommended, according to the University of Massachusetts-Amherst Agriculture and Landscape Program website. Inserting fertilizer spikes into soft, wet soil or in holes specifically dug for them around a tree or other kind of plant is the best procedure. How you use the spikes depends on their specific brand, the size of the plant you want to fertilize and the plant's type. For example, an indoor potted plant may need just two or three spikes about every 60 days while rows of vegetables may need eight spikes per every 1 square foot. In general, the spikes are inserted so that they sit just below the soil surface and are spaced evenly around the target plant. Follow the specific application directions on your fertilizer spikes' package, however. Most plants benefit from fertilizer at the beginning of the growing season. Some also may benefit after their first flush of blooms fade or when their fruiting begins. When to fertilize a lawn depends on its type of grass. If your lawn has cool-season grass, then fertilize it in spring and again in fall; warm-season grass should be fertilized in spring and summer. Houseplants can be fertilized year-round. Cool-weather vegetables that mature quickly usually do not benefit from slow- or controlled-release fertilizers such as those in spikes, but warm-season crops can benefit from such fertilizers applied during planting time, according to a National Gardening Association website article. What Happens If I Spread Urea on My Lawn?